Sundays seemed a lot more special when I was a child. Now, more than not, it’s just another day. In the south, dinner was served as soon it could be placed on the table after church. Almost everyone had a dining room, and it may have been unused for six days of the week, but in our house the table was set with the best dishes and the whole family was expected to be present when Pappy said the blessing. My immediate family consisted of Mother, Daddy, and me. We lived in a large house in Nashville with Dooley, my maternal grandmother and Pappy, her second husband. Also in residence were my Aunt Mildred (for whom I am named) and her daughter, Dorothy Jeane. The two of them lived in the country with Aunt Mildred’s husband’s family. After he died of TB, Aunt Mildred and Jeane moved into Dooley’s house with us. Part-time occupants included my step-aunt Abie, my paternal grandmother, and my step-great grandmother, Granny Karl, who was Pappy’s stony-faced mother. With all the comings and goings it was necessary to count heads before the Sunday dinner table was set. After dinner, still dressed in our Sunday best, the extended family scattered. We either received company, or we went visiting. My very favorite place to visit was way out in the country in a settlement of sorts called Smith Springs. Never mind that the fields that were my playgrounds are now filled with suburban homes when Nashville grew so much and so fast it burst at the seams. I will always remember it as my second home in the country. It is evergreen in my memory. Three of Mother’s cousins, all siblings, lived with their families on a large parcel of land. Mother’s cousin Hazel lived in the original homestead far off the road up a hill. 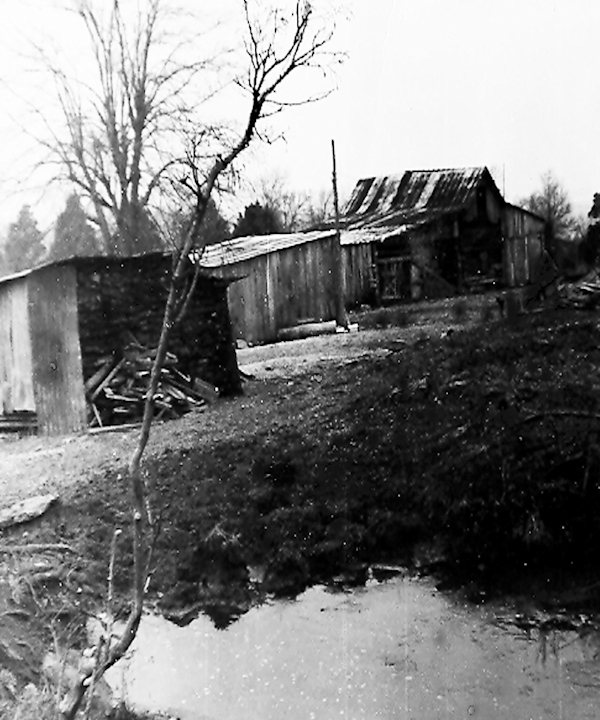 Hazel’s sister, Louise, lived on one side of the property and her brother, Robert, on the other side. Their houses were located close to the road. These four first cousins had their first babies within 10 months of each other. Hazel had Jimmy who was a week older that I. We were born in August of 1936. Mother and Hazel often joked that they ran into each other at the hospital. Hazel was leaving carrying the newborn Jimmy as Mother was hurrying in to have me. 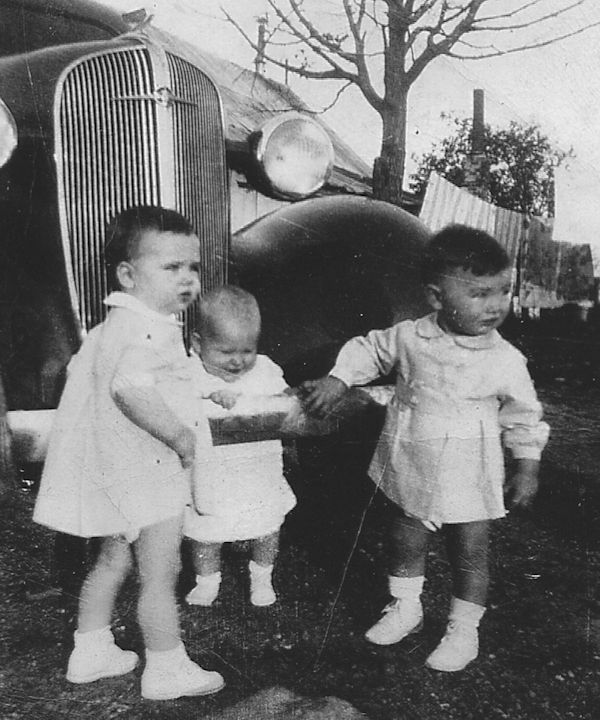 Three months older than the two of us was Marjorie, Cousin Louise and Otis Charlton’s daughter. Cousin Robert and his wife, Lola, had Ina Lou in March of 1937. She was double-named for her grandmother and for my grandmother. (I am making an effort to not confuse you here, but I can understand if it’s clear as mud as we used to say back in the dark ages). Mother, Hazel, Louise, and Robert were all first cousins, their fathers being the Russell brothers. 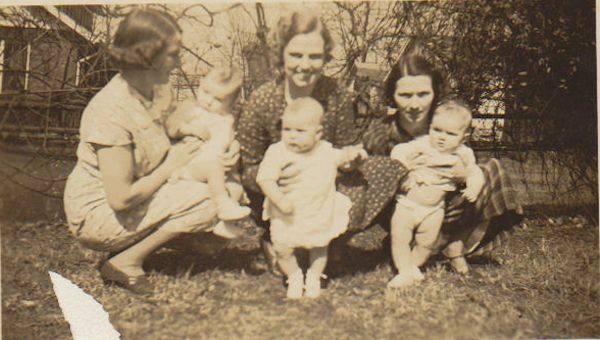 We firstborns, Marjorie, Jimmy, Ina Lou, and I (Mildred Ann) are second cousins. So, it came to pass I had three country cousins, all very near my own age, Our mothers delighted in their children and in each other. We had our pictures taken constantly, I was mostly a disagreeable child, and there are no photos of me smiling just as there are none of Jimmy being still. Marjorie is shown very reserved and dignified. Ina Lou, being younger than the other three often made her distrust of her older cousins known by being heard. Believe it or not, these babyhood propensities, so often photographed, turned out to be indications of our grown-up personalities. Four years later there was a regular population explosion when all four adult cousins plus one more who lived in town, had babies. In this second batch came our cousin Tim. He was actually Timothy Russell, III. 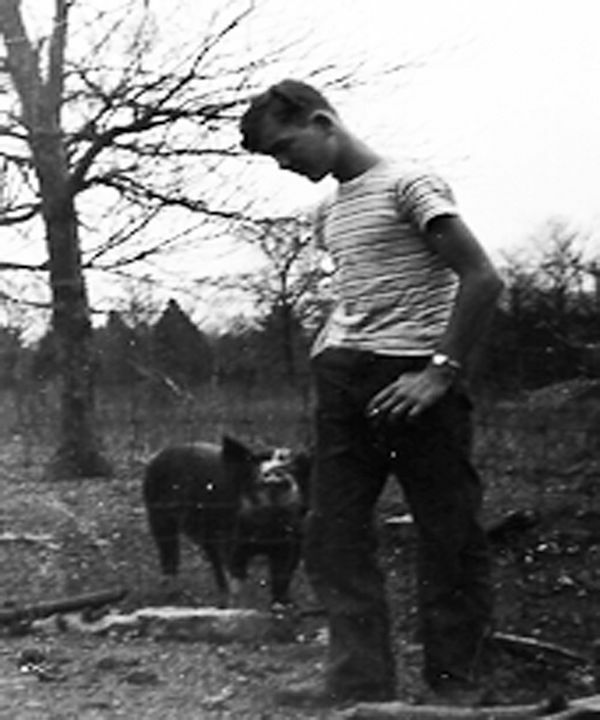 The first Tim was the patriarch of all the country siblings, and my grandfather’s brother. The second Tim, or T.J. lived in the city with his wife, Tilly. 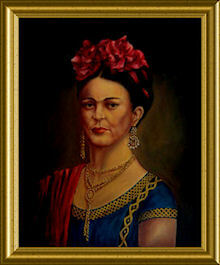 She was from a very rich family, and was older than her husband by quite a few years. After the third Tim was born, she dedicated herself fully to him, and T.J. went along his merry way. He didn’t get to really know his son until years later. Tilly loaded up and often brought Baby Tim to the country. In addition to the boy, she brought several changes of his clothes, extra blankets, his food, a jug of city water and a bottle of milk from a commercial dairy. In later years I often wondered what kind of germ or disease she thought may attack Tim. The rest of us were hale and hearty, and were turned loose to go and do whatever we pleased. Maybe the other grown-ups were offended by Tilly’s obvious distrust of the country environment, but I don’t think they took offense. I do think they got a laugh or two out of it. To this good day, Jimmy still teases Tim about the special treatment he received. Certainly, off limits to Little Tim was a communal water pail just outside the kitchen door with a metal dipper handle hooked over the rim. We had the option of drinking from the dipper or filling glasses that were available nearby. I loved to drink from the dipper. It had a rolled top and tasted metallic, which somehow enhanced the coldness and crispness of the water. The pail was outside in the “Dog Trot.” For those unfortunate souls who have no connection with southern country life, I will explain. The Dog Trot was a common architectural fixture in the south. Nashville gets remarkably hot and humid in the summertime. To take advantage of the slightest breeze, the farm houses were constructed in two sections connected with a long hallway that was open to the outdoors at both ends. Each section of the house had a door from two rooms that opened onto the Dog Trot. I often wished our city house had been constructed the same way. We could dash to the back yard from the front porch before the grown-ups even knew we were gone. 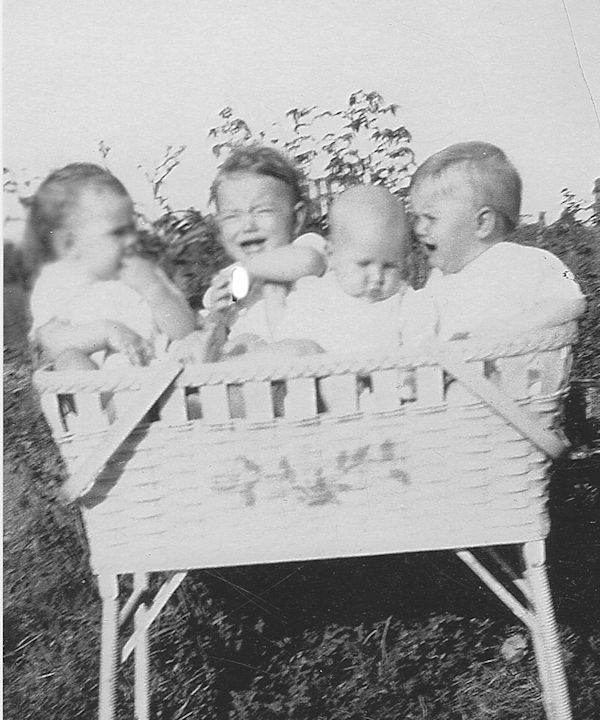 When we original four left babyhood for bigger adventures, the entire acreage was our kingdom. We explored it all. The old barn was particularly intriguing for me. It seemed to have dozens of rooms filled with the most astonishing assortment of farm and mechanical implements. It took a few years until I was brave enough to venture into the barn. It was quiet and cool, and a little scary. On one notable occasion I tiptoed into a room in which a cow was escaping the afternoon heat. I screamed, upsetting the poor cow as she nearly trampled me on her way out of the barn. I loved climbing over the stile that provided access to the other side of fence down by the road. The stile negated the necessity of opening and closing the big gate at the driveway. I considered it a fantastic innovation, although I’m fairly certain it was in use by the first settlers and before. I even wandered through the tall weeds in back of the barn, much to the gastronomical delight of the resident chiggers. It was a short cut to the Charltons’ log cabin on the road. I loved to listen to the crickets, the birds singing their hearts out, and the wind in the willow trees. I often stood still just to hear the quiet that was somehow not disturbed by the country sounds. My cousins and I played all kinds of wonderful games: hide and seek, Red Rover, Mother may I, and kick the can. It was so much fun to have people to play with whom I knew so well. There was no need for shyness or intimidation. I could wander off by myself or play with a field full of cousins and be completely at home even in this wonderland. Jimmy was the adventurous type, much to his parents’ consternation on many occasions. One particular adventure was had also to his own detriment. One day it occurred to him that the steep pitch of the metal barn roof would make an ideal slide. Up he climbed as far as he could on the roof. He then sat down and slid all the way to the ground. He was right. It was a fantastic slide. Unfortunately, there was an errant nail protruding from the metal surface. As he slid down Jimmy managed to find it in the worse possible way. He was bleeding profusely when he made it into the house. There was a rushed trip to the doctor’s office, and after many stitches he was sent home, having learned a hard lesson the hardest way possible. Regrettably, she is correct. I had a horse once, and he scared me to death, but that’s another story. I was a little scared of Dolly at first. I tried to sneak up on her when I was alone. I just wanted to get a better look. Somehow, she always heard me coming. It didn’t matter how quietly I walked, her head turned toward me and blind though she was, she looked right at me. I always ran back into the dooryard. I don’t know how old she was, but Old Dolly is huge in my earliest memory of the place. She was never anything but “Old” Dolly. Her back could accommodate four or five of us comfortably, and whoever sat nearest her head would gently push her neck in the direction we wanted to go. She walked when we told her to go and she stopped when we told her to “whoa.” I loved her with all my heart. Citation will always live in my memory as my favorite race horse, but Old Dolly lives in my heart forever. There was a pond nearby in the barnstead, where we were not allowed to play. Often, it had a green scum that squelched any desire we may have had to enter the water. I marveled at the animals drinking from the pond. I noticed they managed to avoid the scum. It was an actual working farm, although all three men on the place had jobs as well. Someone arose before dawn in the winter to milk the cow, and again after work every evening. There were chickens for eggs and meat. A large portion of the fields was allotted to a garden. Every kind of vegetable and fruit was grown there. In a pen far away from the house the families raised hogs. On a particular cold November day, the men gathered at the pen. My father was often among them. It was hog-killing day. Afterwards, the animals were cleaned and cut up into portions that were smoked in a small shed built especially for that purpose. There was lots of country ham, which is strictly a Southern delicacy. It is so salty, Yankees don’t always cotton to its taste. They often prefer the milder spiral-cuts so popular today. Many times when we visited on Sunday afternoon, Hazel would forestall our departure by saying “Ya’ll spend the night.” Of course, Daddy had to go to work the next day, but Mother would often tell Aunt Hazel we would stay and Daddy could pick us up in a day or two. I was ecstatic. Mother and I, and later my little sister slept in a bed just off the Dog Trot. I’ll never forget the aroma of home-smoked bacon and ham being cooked on the huge wood stove. By the time the biscuits came out of the oven, we were seated at the table. Everything was homemade. There were mounds of creamy butter (hand-churned) and the best preserves on earth. Nothing has ever tasted as good as Aunt Hazel’s breakfasts. At harvest time, many days were given over to canning and putting other vegetables away for the winter. Near the back of the house, there were double doors built into a little hill. The doors enclosed the root cellar, where all the food was put by. When winter came it was brimming with jars of home-canned vegetables, fruits, and jams. It was also a great shelter when tornados threatened, as they often do in the south. As the years went by, I lost contact with my country cousins. They never lost each other. In October of 2013, I was in Nashville when my sister died. My cousin Jeane told Jimmy I was in Nashville. He gave her a number and told her I better not leave town till I talked to him. I called him, and he came to see me at the hotel where I was staying. We knew each other immediately. We talked about the past and the times in between then and now. He told me the annual family reunion was in a couple weeks. I wanted to go more than anything. I found a flight that wouldn’t break the bank, and I decided to go to the reunion. There was Jimmy and his wife, Becky, waiting to pick me up at the airport. I saw each one of my cousins, most of their children, their grandchildren, and in Jimmy’s case, his great-great-grandchildren. I was so glad to see everyone. It was also overpowering. We tried to catch up, but it left too much to tell in one short day. I spent the night with Jimmy and Becky in their gorgeous home in Murfreesboro, and I hated to tell them goodbye. I don’t ever want to lose touch again. Like me, many have scattered to the four winds, but they manage to still keep up with one another. I will do the same, now and for the rest of my life. Jimmy is, of all things, a golfer. It’s hard for me to imagine Jimmy swinging a golf club, but I guess he’s pretty good at it. I asked him what kind of score he shot, and he said he could shoot his age, which, at the time, was 77. Last June, I was in Nashville again for my 60th class reunion. I loved seeing my old friends again, and I was particularly happy to be able to spend another night with Jimmy and Becky. The next day, Jimmy had a golf tournament. He left early, giving me time to visit with Becky all day before my 6 pm flight. What a wonderful new cousin she is to me. We talked and talked about everything under the sun. I had a great time. It’s so rare for me to hit it off with someone new right away, but that’s exactly what happened with Becky. Sometimes I despair over what the future will bring. I don’t like to look at it too closely, because it is iffy at best. I guess everybody my age likes to look at the past, and that’s certainly true of me, but thank God for my Cousin Jimmy for helping me to bring back my past, because it’s now a part of my future as well. And that can only be a good thing – a very good thing! Here are a few photos from long, long ago taken at the Russell Family Homestead. To my knowledge it was never called that. I called it simply “The Country”. 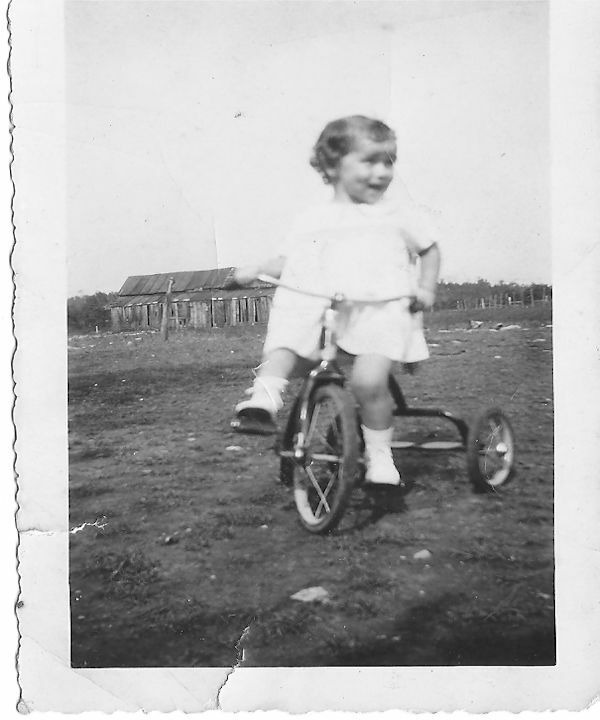 The oldest of the second cousins is Dorothy Jeane, here shown riding a tricycle on the farm. 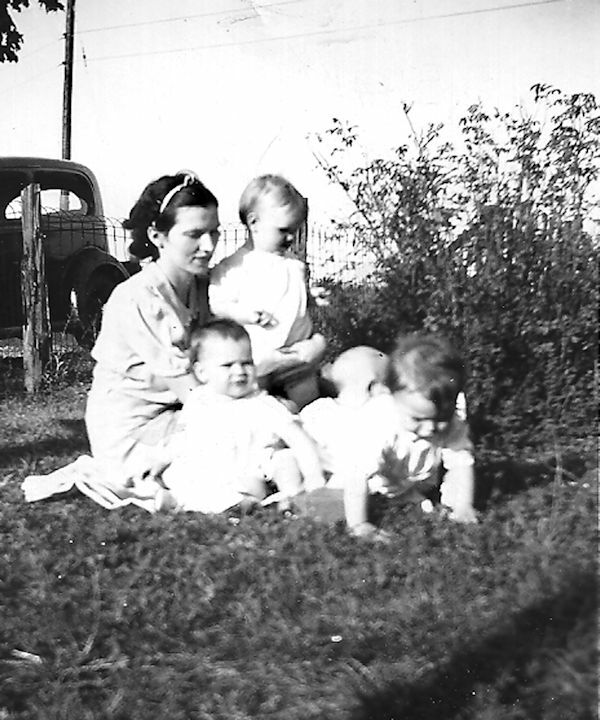 Aunt Hazel with Jimmy, Mother with me, Aunt Louise with Marjorie, in front of the grape arbor. Aunt Louise with all four firstborns. Someone thought it would be really cute to photograph all four babies in a bassinet. Jimmy and Marjorie obviously disapproved, while I gave them my usual sneer, and Ina Lou ignored them. Someone thought it would be even cuter to photograph poor Ina Lou behind the car bumper, while Jimmy and I were just glad it wasn’t us. 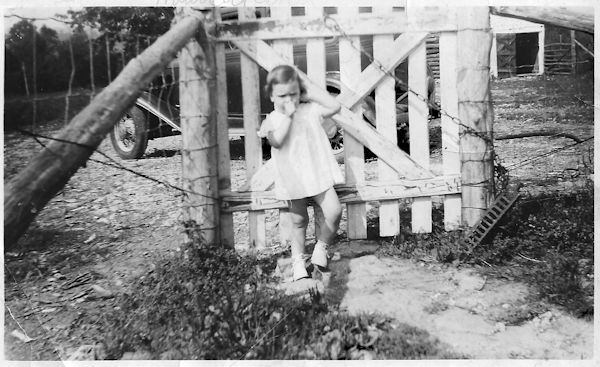 This is me sucking my thumb in front of the gate that led to the barnyard. I really didn’t like to have my picture taken. Still don’t. I mentioned earlier that I was really into crochet. Here’s my grandest accomplishment. His name is Tommy Turkey, and I made him for our Thanksgiving Day centerpiece. He is a larger version of a Teri Crews Design, and I love him. 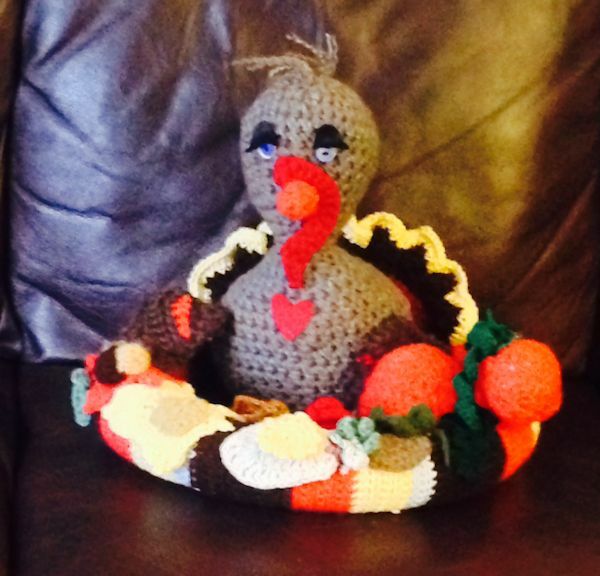 Tommy is sitting in a crocheted ring decorated with autumnal decorations. This ring served double duty. It was our wreath for the autumn season. Maybe I’ll have it finished by Christmas 2015. Teri has tons of really cute animals and other softies. Her web site is www.tericrewsdesigns.com. Take a look at it. You’ll be amazed!